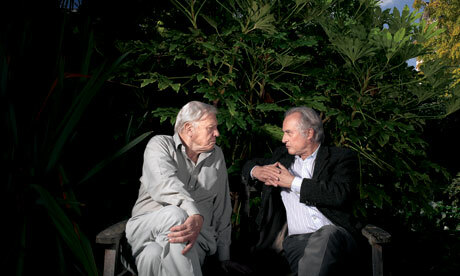 The Guardian recently paired up David Attenborough and Richard Dawkins for a short conversation. Listen to the audio here. [Different question] - RD: There does seem to be a sense in which physics has gone beyond what human intuition can understand. We shouldn't be too surprised about that because we're evolved to understand things that move at a medium pace at a medium scale. We can't cope with the very tiny scale of quantum physics or the very large scale of relativity. DA: A physicist will tell me that this armchair is made of vibrations and that it's not really here at all. But when Samuel Johnson was asked to prove the material existence of reality, he just went up to a big stone and kicked it. I'm with him. RD: It's intriguing that the chair is mostly empty space and the thing that stops you going through it is vibrations or energy fields. But it's also fascinating that, because we're animals that evolved to survive, what solidity is to most of us is something you can't walk through. Also, the science of the future may be vastly different from the science of today, and you have to have the humility to admit when you don't know. But instead of filling that vacuum with goblins or spirits, I think you should say, "Science is working on it." DA: Yes, there was a letter in the paper [about Stephen Hawking's comments on the nonexistence of God] saying, "It's absolutely clear that the function of the world is to declare the glory of God." I thought, what does that sentence mean? !